Truth: this just might be *THE* most delicious recipe on Vegan Chickpea to date. 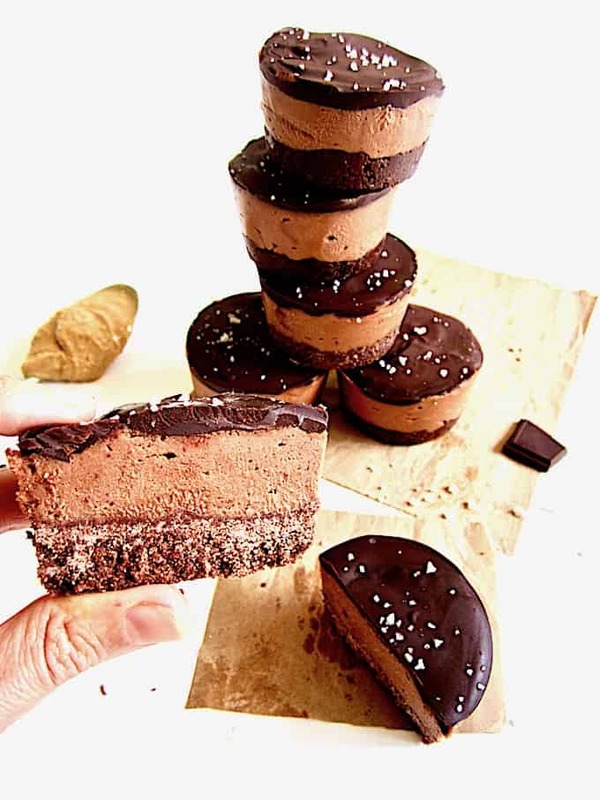 I know there are a lot of ways to define delicious and it’s basically impossible to compare the deliciousness of a savory dinner entree like my popular Broccoli, Kale & Rice Casserole to this sweet, salted chocolate peanut butter combo; they’re just not even on the same playing field – though both fields are REALLY tasty ones that I want to play on! Peanut Butter… oh, Peanut Butter Pie! 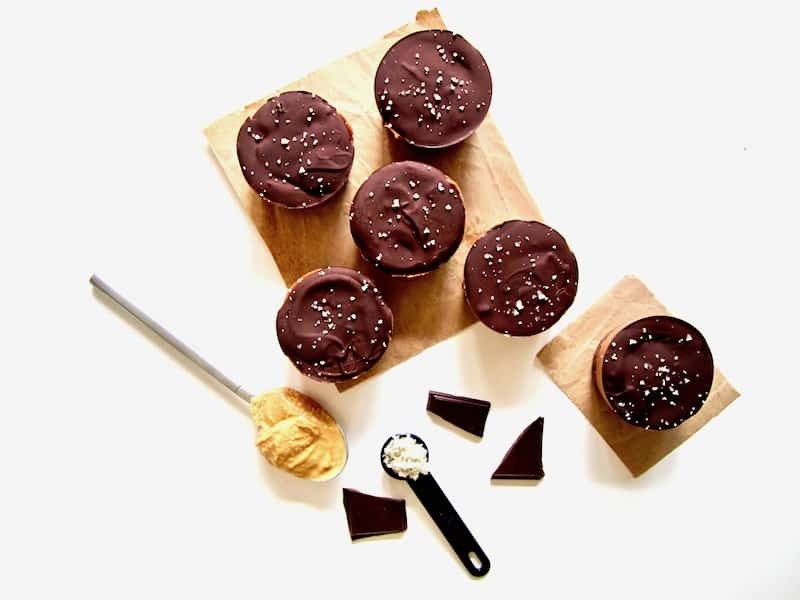 No – Chocolate… Salted Chocolate! 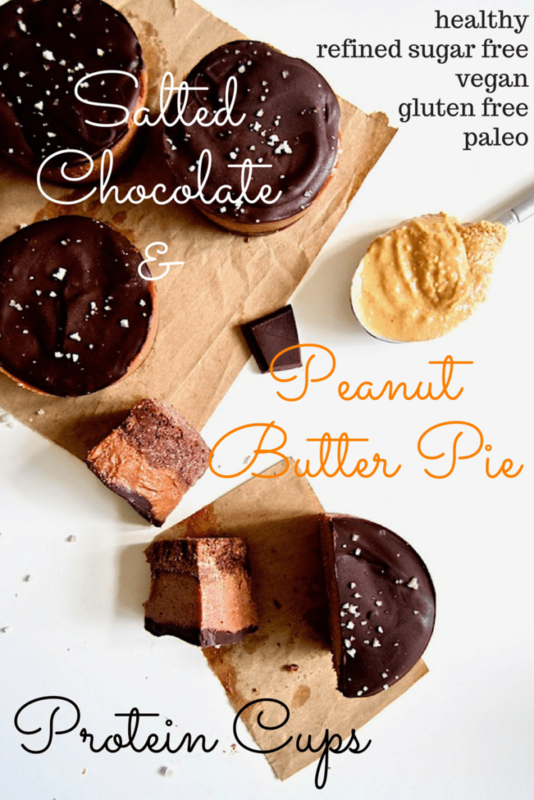 AH – Chocolate AND Peanut Butter! 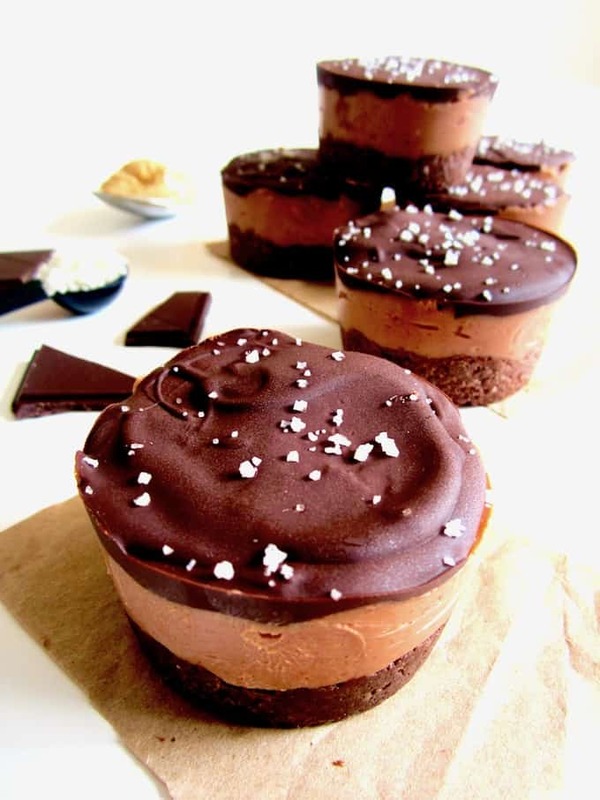 …Salted Chocolate Peanut Butter Pie!!! Oh, and I’ll add some protein for good measure. And make them in muffin cups because they’ll look cute, and be easier to cut that way. 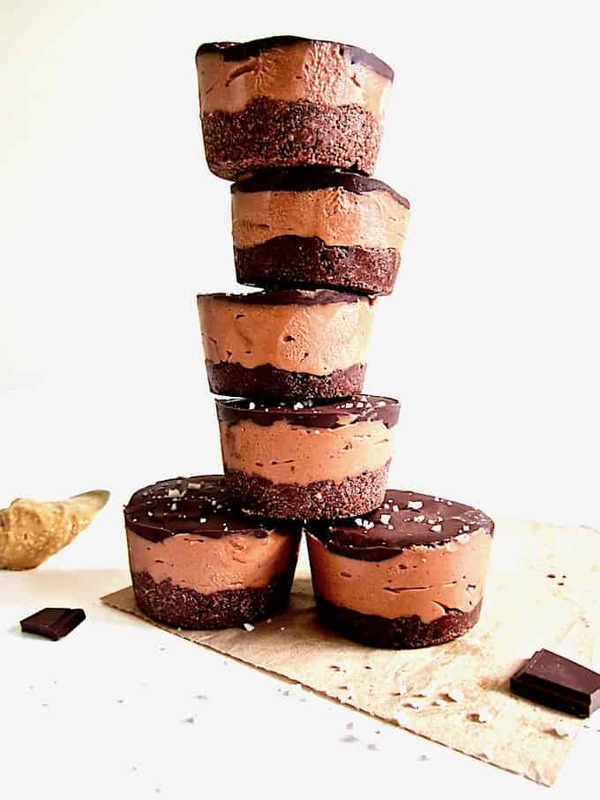 And THUS… the leaning tower of Salted Chocolate Peanut Butter Pie Protein Cups was born. 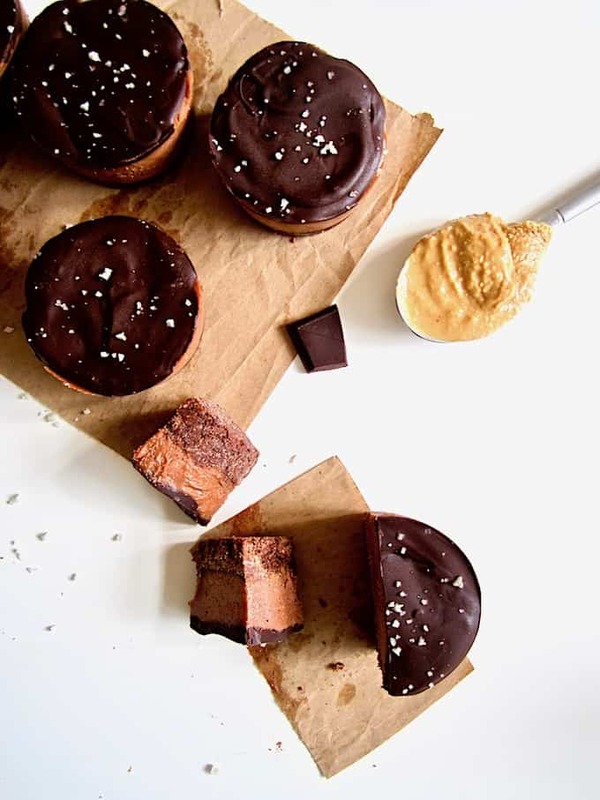 I suppose I’m biased when it comes to this recipe though because I don’t think there is a better combination in the world than chocolate peanut butter. Am I right? As a kid my favorite candy was Reese’s Peanut Butter Cups. In fact, me and both my siblings all loved those things and have fond memories of getting the different shaped candies at different holidays – Reeses trees at Christmas, eggs at Easter, hearts at Valentine’s Day, pumpkins at Halloween. Those holiday editions always had extra peanut butter in the filling. C’mon, who else knows what I’m talking about!?! I was in the Netherlands at the time and a few Dutch people looked skeptically at the pie, as it’s not a combination they grew up with or really have in their country (I know, it’s hard not to pity them, right?! Haha! Just kidding… sort of!).
? —> That was my jaw proceeding to hit the floor. Uhhmmm WHAAAATT!!!!??? “Well then you must try it!” I said. As it turns out, my Dutch friends we’re overly impressed. They didn’t dislike the pie, but didn’t go nuts for it (pun intended). My friend Roel said, “The taste takes some getting used to.” Well OKAY fine, fair enough, but no more pie for you then – leave it for the rest of us who absolutely it! ? And that’s my story! I hoped you liked it, because I have another (much shorter) one. A similar thing happened but in the reverse when I studied abroad in Brisbane, Australia for a semester in college and I was introduced to the infamous Vegemite spread. I literally thought I might throw up in my mouth when I tried a bite of it on my toast. It was the saltiest, most bitter and nauseating thing I had ever tasted. Meanwhile, my Aussie housemates are chomping away with huge smiles, enjoying one of their favorite breakfasts. To be fair, perhaps I’d like Vegemite now as my taste buds have drastically changed since college, but my gag reflex just might still have that memory from 11 years ago. I’d actually be curious to test this out and see if I still have the same reaction! Alas, it’s not gluten free (it’s made from barley) so I (un? )fortunately wont have the chance. It IS vegan, however, if any of you are interested! In all seriousness though, I find this all a really fascinating cultural experience because it just goes to show how influenced we are by what we grow up with; our taste buds and preferences literally get defined through what we are exposed to. Makes you think, right? What if we only exposed our children to healthy, clean, nourishing, real foods – they would likely never even develop a desire or taste for high sugary junk foods! I imagine that artificially processed and packaged foods especially would taste pretty icky to them. Now that I’ve gone off on the biggest tangent of all time, let’s circle back and talk about this delectable and healthified recipe. There is only 1/3 cup + 2 Tablespoons of date syrup in this entire recipe (which makes 12 servings). Date syrup has probably become my favorite sweetener recently. It’s just dates, so it’s natural, unrefined, vegan and lower glycemic than maple syrup and agave ( = less of a blood sugar spike and better for people with conditions like diabetes). For Europe: So Free – a new line of vegan chocolates from Plamil (makers of vegan mayo). Some are xylitol sweetened (they have flavors like plain dark chocolate, hemp seed, mint and espresso) and one flavor of dark chocolate is coconut sugar sweetened (the rest of their line has regular sugar so look for that if you don’t eat sugar!). I found that these melt nicely for this recipe. 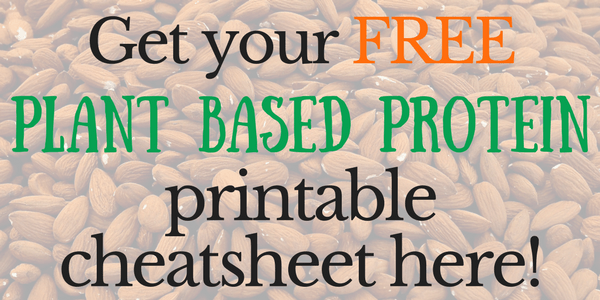 I used plain sprouted rice protein in this recipe. I was in the Netherlands at the time and my favorite European brand is Pulsin’s Unflavored Rice Protein . For USA options, there are many, but a good, high quality, plain flavored protein powder is Amazing Grass Protein Superfood (The Original) . Whole Foods brand of 365 Everyday Value products also has a plain pea protein powder that would probably work well. I have not tested this recipe with any protein powders other than Pulsin but I think any powder that you enjoy will work here, as it’s not getting baked, so no need to worry about the texture getting funky from the powder (but I do recommend plain flavor, or vanilla). I love my silicone muffin molds ! Why use silicon pans? They’re non stick, so your peanut butter cups will pop right out (or your muffins, if you use this for its intended purpose!). Therefore washing this is also easier – no scrubbing required. You can use these to make other frozen desserts (like mini cheesecakes) or warm savory mini pies that won’t stick to the pan. For baking, I’ve also found them to cook more evenly than traditional pans. They’re 100% silicon so are BPA and filler free. Also dishwasher, freezer and microwave safe. If you don’t have a silicon muffin pan you can use a metal one, but I recommend creating tabs from parchment paper that will help make removing the cups from the muffin tins once frozen much easier. The tabs should be about 4″ long and 1/2″ wide. Lay them in each slot of the muffin tin before pressing in the crust. I seriously could NOT STOP eating these when I made them… it was kind of a problem. At least as far as sweets go they’re much healthier than some alternatives, right?! I hope you love this recipe just as much as I do! For the crust: Combine all ingredients in a bowl and mix well. Divide evenly into 6 portions and press into a silicone muffin pan . IIf you don't have a silicon muffin pan you can use a metal one, but I recommend creating tabs from parchment paper that will help make removing the cups from the muffin tins once frozen much easier. The tabs should be about 4? long and 1/2? wide. Lay them in each slot of the muffin tin before pressing in the crust. For the filling: Combine all ingredients and mix well. Pour evenly on top of the 6 crusts. Freeze for at least 2 hours to set. For the topping: Melt the chocolate in a double broiler or slowly in a saucepan on low heat, stirring frequently. Distribute evenly on top of the 6 cups. Top with coarse sea salt, to taste. Freeze for at least 30 minutes. Keep these refrigerated - they'll last at least 5 days. You can also freeze them and remove them as needed, but allow to thaw at room temperature for AT LEAST 20 minutes first so they're not rock solid! *I've also tested this with coconut flour and enjoyed the flavor. It gives more of a contrasting flavor and texture than the almond does, but is a little drier. Given that the coconut flour crust will be drier, you need to double the amount of oil to compensate - so 1/4 cup of coconut oil. 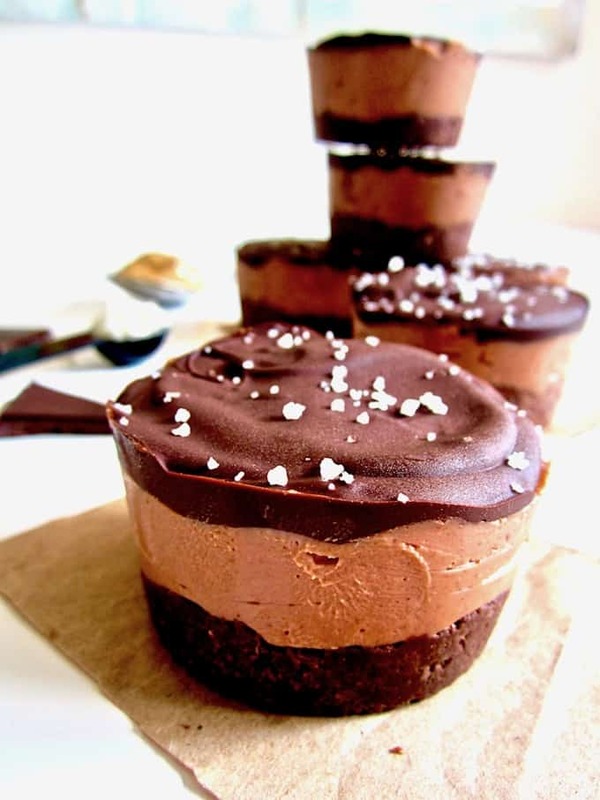 **I have not tested this recipe with any protein powders other than Pulsin but I think any powder that you enjoy will work here, as it's not getting baked, so no need to worry about a resulting funky texture (though I do recommend a plain flavor, or vanilla). Whole Foods brand of 365 Everyday Value products also has a plain pea protein powder that would probably work well. Yummy!!! 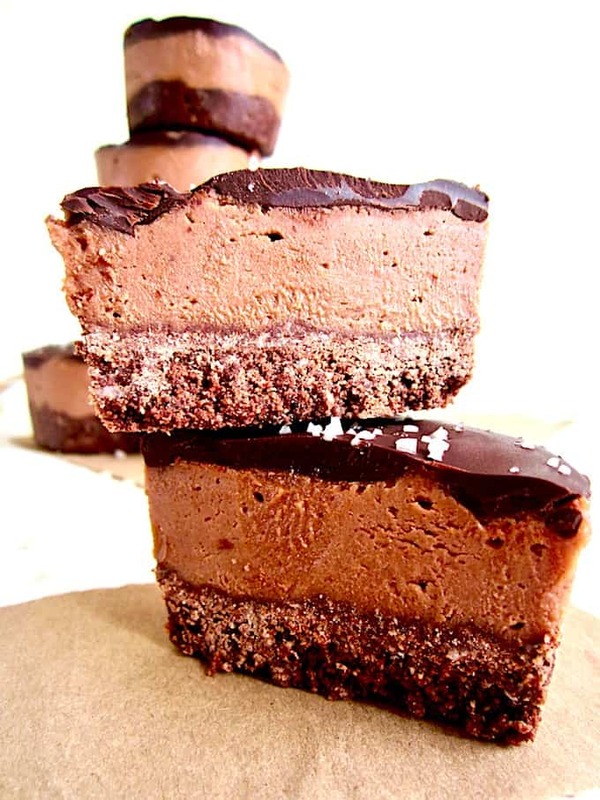 This peanut butter pie looks delicious and so rich! 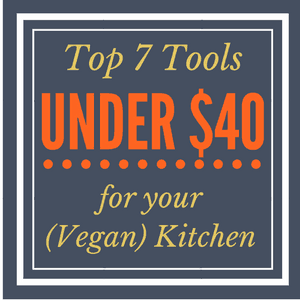 Love the product suggestions and info, makes baking a lil bit easier for amateurs like me hah! There's no way mine are going to turn out like yours! Awesome! Thank you Kate, I hope you love them! These look and sounds amazing! Gotta try these soon.